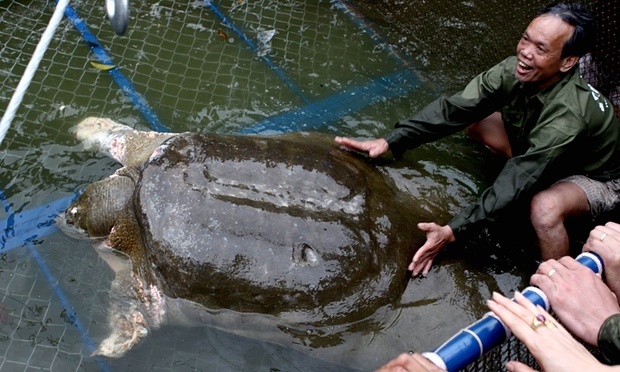 A massive sacred turtle honoured as a symbol of Vietnam’s independence struggle has died. Vietnam’s state media released the death of the rare endangered swinhoe softshell turtle which has become the stuff of legend within the country. The death of the Hoan Kiem turtle has prompted a massive outpouring of grief and fears that the death plays on the ills of the forthcoming communist leadership handover. Scientists believe the rare turtle was only one of four known throughout the world. The turtle, known as a ‘Yangtze’ giant softshells is nearing extinction. China has only two of the rare turtles, while Vietnam has one example living in a different lake in Hanoi. The turtle was found dead in Hoan Kiem Lake in central Hanoi on Tuesday. It was said to have weighed 440 pounds, and was up to 100 years old. News and media related blogs, along with numerous social media outlets in the country widely publicised that the death was a bad omen for the incoming Communist party.